Bath tighthead prop David Wilson is regarded as one of the brightest front-row prospects in English rugby having won two full caps during the summer of 2009. He made his full Test debut against Argentina in Manchester on June 6 and retained his place for the second Test in Salta the following weekend. Wilson's rapid rise to England prominence came after joining Bath from Newcastle Falcons at the end of the 2008-09 season. Strong in the set piece, Wilson's fine work ethic and adept handling skills won him a place in Martin Johnson's England Elite Player Squad for 2010-11. Wilson featured six (five from the bench and one start) times for England in the 2010-11 season in a campaign disrupted by injury. The combative prop earned himself a place in Johnson's 45-man training squad and then made the trip to New Zealand. However he made just one appearances as a substitute against Romania during the tournament. 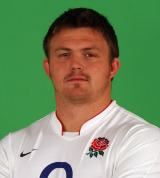 And despite being included in England's squad for the 2012 Six Nations, Wilson failed to make a single appearance.